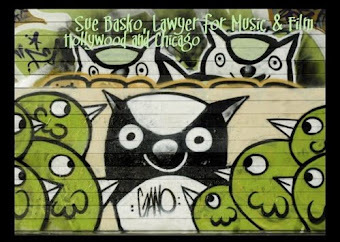 Sue Basko, Lawyer for Independent Media: Anonymizer: What is it? 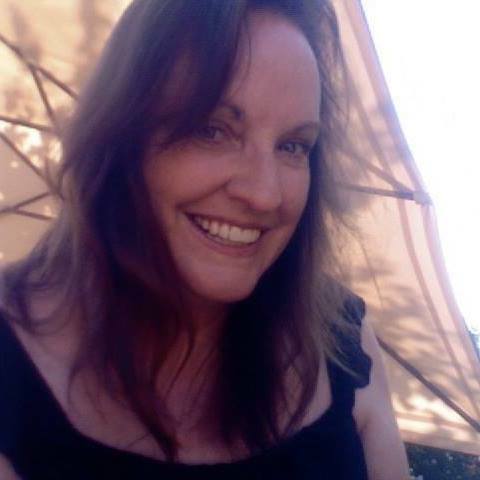 UPDATE JUNE 16, 2013: I had a nice interchat with Lance Cottrell, who developed Anonymizer. He noticed my posting and was amused by the old screen shots from back when he was a struggling graduate student just starting Anonymizer. My question for Lance was whether Anonymizer keeps user logs, and if so, for how long, and what is on them. “We do not keep any logs of user activity. Obviously we have billing records and such, but nothing that would allow us to connect users to their activities. We have gotten about a subpoena a week on average for the last 15 years or more. You will not find a single incident where a user's privacy was compromised because we revealed their information. There is no effective way of resisting subpoenas if you have the info, and you are not allowed to pick and choose which are "legitimate". The only viable path is to not have the data at all. 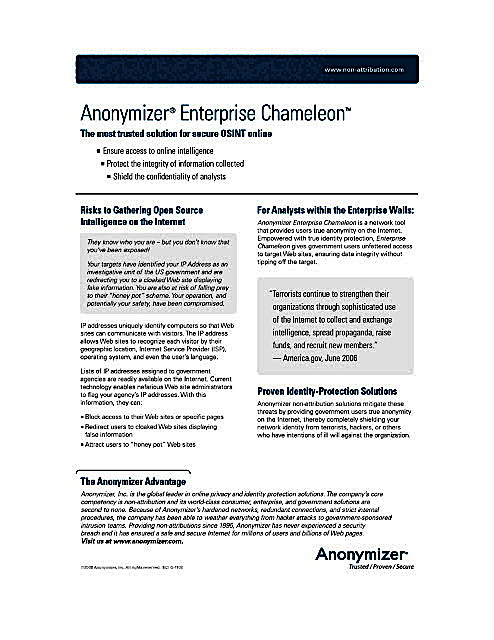 Anonymizer is a corporation, a website, and a software product for anonymizing oneself while using the internet. Anonymizer is a trademark name for software that hides the IP address and provides anonymity in surfing the web. Anonymizer is the baby of Lance Cottrell, a boyishly handsome man who is known to be well-liked. Let's jump in the Time Machine and go back to the mid-1990s. Lance Cottrell was a graduate student who formed Infonex with other members of his family trust, Don M. Cottrell and Ann B. Cottrell. The Cottrells later formed Infonex Holdings, apparently for the Anonymizer software and trademark. Infonex Holdings, a Nevada Corporation, merged with Anonymizer, Inc., a California Corporation, on June 16, 2003. The directors and officers of Infonex became the directors and officers of Anonymizer, Inc, and all the employee benefits stayed the same. Lance Cottrell signed the papers as President of both Infonex and Anonymizer, Inc. Thus, Anonymizer, Inc. was born. 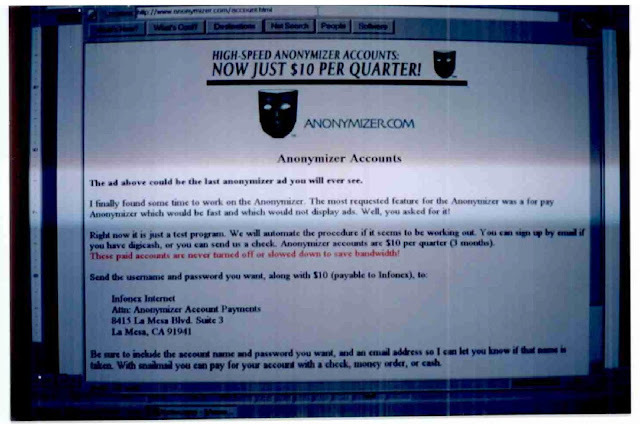 Lance’s early web pages for Anonymizer.com showed a mask, much like the Anonymous masks of today. 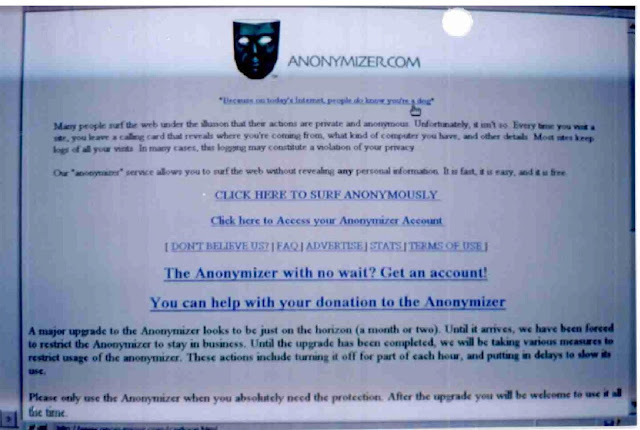 Have a look at a photo of a computer screen of an Anonymizer.com web page from way back then. It's worth reading to get a taste for the history of the internet. Compare this with today's version of www.anonymizer.com which is all corporate slick. Anonymizer.com early screen asking for donations. To view a picture larger, you must pull/ drag it off the page and click it. "Many people surf the web under the illusion that their actions are private and anonymous. Unfortunately, it isn't so. Every time you visit a site, you leave a calling card that reveals where you're coming from, what kind of computer you have, and other details." "Our "anonymizer" service allows you to surf the web without revealing any personal information. It is fast, it is easy, and it is free." Then here is Lance asking people to subscribe to a faster, for-pay Anonymizer for $10 per quarter, or $40 per year. "These paid accounts are never turned off or slowed down to save bandwidth!" It even gives an option to pay online with MarkTwain Ecash. Anonymizer Screen shot offering the service for $10 per quarter. Here is Lance just outright begging for donations. This makes me like him a bit. Also, the fact that he misspelled "operate." "It is very expensive for us to opperate the Anonymizer. While it is our intention to make the Anonymizer self-supporting through advertising, and to offer paid accounts, we are far from that goal right now. We appreciate your support for this project." This was 1997. In 2005, Mr. Cottrell applied for a patent for the Anonymizer software with co-inventors Brian Bennett, Daniel Tentler, and Gene Anderson. The patent application is extraordinarily well-written, making the program understandable to those without extensive computer experience. The application immediately makes clear how the software works and why someone would want to use it. The patent was awarded in 2008 for "A system for protecting identity of network devices in a network environment. The system includes an apparatus having an interface to the network for completing connections to destination devices on the public side of the network. The apparatus includes a masking element for associating at least one masking identifier with a communication from the network device and masking the identifier of the network device from the destination device." Lance Cottrell continued along as the "President, Founder, and Chief Scientist" of Anonymizer, until 2008. Then, Lance Cottrell connected with Richard Hollis Helms, the former CIA agent and CEO of Abraxas Corporation, and sold him Anonymizer, Inc. Mr. Cottrell then became the Chief Scientist/ Chief Technology Officer of both companies. It was also in 2008 that Anonymizer, Inc. first started taking out loans on its intellectual property. In 2010, Ntrepid Corporation was formed and Mr. Cottrell became its Chief Scientist. Today he is employed by Ntrepid Corporation, and Anonymizer, Inc. and is a consultant to Taia Global, Inc.
Lance Cottrell no longer needs to hound people to buy $10 subscriptions to Anonymizer. Today, Anonymizer.com offers Anonymizer for Home and Anonymizer for Business. The home user can get a one year subscription to Anonymizer for $80 or a souped-up version for $100/ year. Anonymizer also offers Nyms, which are anonymous email accounts for $20/ year. The Business products offered by Anonymizer, Inc. have a darker, more sinister tone. These include such things as Non-Attributable IP (internet protocol) addresses and IPs that change addresses and locations automatically. Anonymizer Inc also sells harvesters which gather information anonymously using fake IP addresses. These products have so much potential for abuse in the hands of businesses and governments. As with Abraxas Corporation and TrapWire, Inc. the sales pitch for Enterprise Chameleon is one of fear of terrorists. The ad explains how the government can use anonymity to spy on others. This is a sad turn for a product associated with Lance Cottrell, who started his career designing software to give online privacy to the individual user. Now, in this Orwellian present, "privacy" means "spying on others." Lance Cottrell is widely known as a champion of online privacy. He recently wrote on his blog that others have questioned his allegiance to privacy. I assume they are questioning this since he is involved in the development of products that take away peoples' privacy and allows them to be spied on. He wrote this blog post where he explains that he thinks he can comfortably supply services to players on all sides - the spies, the spied upon, and the spied upon who are spying right back:"Some users of my personal / consumer privacy services see themselves as in opposition to some or all of my corporate or government users, and vice versa. I think both are important and I protect the anonymity of all of my customers equally. There is no “crossing of the streams.” None of my customers get any special insight into the identities or activities of any of my other customers. As above, there are no secrets like that which would last very long, and it would destroy my reputation. Honor, reputation, and a man’s word being his bond may be very old fashioned ideas these days, but they carry great weight with me. I hope this clarifies where I stand."